More rate adjustment clauses (RACs) on your power bill than points on this buck? Soon. Here they go again, using your electric bill to pay for government spending programs and blurring the distinction between utility costs and taxes. Everybody heard Thursday about that new coal ash management program adding to the pantheon of rate adjustment clauses (RACs) driving up electricity bills. Later in the day, with far less notice, a House of Delegates subcommittee approved yet another RAC and allowed potentially major new costs to inflate an existing one. House Bill 1840 was the first RAC bill approved by a House Commerce and Labor subcommittee Thursday afternoon, asking ratepayers to pay unknown sums to build transmission lines to empty economic development “business parks.” Just how much spending on this speculative investment is planned is not mentioned in the attached fiscal impact statement and was not discussed in the meeting by advocates. Transmission lines heavy enough for major industry are not cheap. The challenges the state faces finding tenants for mega-sites, “despite hefty spending” are well documented by the Associated Press in Sunday’s Richmond Times-Dispatch. Now the ratepayers may join in the hefty spending. This bill was pushed by Appalachian Power Company, and its spokesman complained its industrial usage is dropping. The goal is to lure industries into those empty potential locations, with the utility service ready to go. “We’ve got to bring some industrial load back into our service territory,” APCo lobbyist Ron Jefferson said. (What’s wrong with your stockholder’s capital, Ron?) He was followed to the podium by a platoon of local government officials, ecstatic this was being done without them having to use their own local taxes. While APCo was leading this charge, this is a statewide bill including energy cooperative territory and will have statewide economic impact when the SCC follows the General Assembly’s diktat that transmission lines to empty business parks must be an allowed expense under the existing transmission rate adjustment clause. This follows last year’s diktat about an underground transmission line for an Amazon facility. The second proposal authorizes a new and separate rate adjustment clause, for all customers of APCo and Dominion Energy Virginia, to provide broadband services in the under-served portions of their territories. Notwithstanding the provisions of § 13.1-620, such an investor-owned utility may, either directly or through an affiliate or subsidiary, pursuant to a pilot program that the Commissioner approves pursuant to this section, (i) own, manage, or control any telecommunications equipment, including any plant, works, system, lines, facilities, or properties, or any part or parts thereof, together with all appurtenances thereto, used or useful in connection with the provision and extension of such broadband services; (ii) become licensed to provide broadband services in an unserved area of the Commonwealth; or (iii) lease such telecommunications equipment to other providers of broadband services in an unserved area of the Commonwealth. The bill caps the program at $60 million per year for one utility but imposes no cap on the other. It’s the Phase II utility that gets the cap. You need to know which utility is Phase I and which is Phase II. You know which is which, right? The fiscal impact statement breaks the code and notes its Dominion that is capped at $60 million per year. The same Dominion which will be authorized to collect that additional $225 million a year for coal ash disposal and recycling. And the now untold millions to build power lines to various business parks, only some of which will win new business. “Ultimately if this works it could reduce the rates” said Dominion lobbyist Jack Rust. “That’s what our studies indicate.” Only the costs in excess of revenue will be charged to ratepayers through the RAC. If broadband service in these areas was easy and quickly profitable, the lines would be there now, wouldn’t they? The General Assembly is considering ordering you to invest in a speculative expansion of broadband to rural areas, overcharging you for electricity to raise the capital, and guaranteeing the profit to the utilities while protecting them from any loss. Ten House members have already voted for this. “Any persons wishing to speak against these proposals?” the chair asked on both bills. Ivy Main, on behalf of the Sierra Club, rose to speak alone, and only against the one running transmission lines to business parks. You can see how little the SCC had to say, in those feckless fiscal impact statements. The Republican legislators on the subcommittee will tell you to be happy they defeated a Northam Administration proposal to spend all the carbon tax money from the coming alliance with the Regional Greenhouse Gas Initiative. (Again, this will be another column on another day.) But the defeat of that spending plan won’t stop the carbon tax from appearing on future electric bills, and another House bill that would stop the carbon tax will be vetoed. The draft substitute for Senate Bill 1355 fails to define “typical residential customer” and that question alone is going to flummox the SCC. Limits for the monthly impact on “typical commercial customers” or “typical industrial customers” were noticeably lacking, and none of them will pay only $5 a month. Put all four of these together – coal ash, carbon tax, business park transmission lines, and a major broadband initiative – and it is easy to imagine the day when the generation and delivery of your electricity accounts for less than half of your bill, and the rest is just open or hidden taxes or subsidies. Most polls show Virginians overwhelmingly support cleaning up the coal ash though I admit the devil is in the details with respect to how to do it and who pays for it. Most folks can save the $5 a month with conservation technology and really – the more electricity costs – the more people conserve and use less, anyhow. As long as that money is not going into the pockets of investors……..
And I support expanding the internet into rural areas on the same existing power poles that carry electric and phone …the same infrastructure that the rural electrification program helped to pay for. If we paid to provide electricity to rural areas, why not internet which has become almost as important as electricity for most folks? Using the same power poles that already carry electricity to most homes to string internet wires has to be cheaper than digging more uber-expensive trenches. Putting internet in rural areas is going to improve education to kids who, if they can get access to more/better education can get 21st century jobs and not rely on taxpayer-provided entitlements. Politics is the art of getting someone else to pay for what you want. Formerly, that dictum applied mainly to taxpayers. Now in Virginia, it applies to electric rate payers as well. I’m not quibbling that the ratepayers should be on the hook for the coal ash. What I’m pointing out is the cumulative impact of this trend, which will only accelerate. The road to economic hell is also paved with good intentions. By definition, agency Fiscal Impact Statements are intended to disclose any fiscal impacts on the board or agency tasked with implementing the legislation; they are not designed, or intended, to estimate impacts on those electric customers who will have to pay for these items. The SCC does, at the request of a lawmaker or patron, prepare such cost estimates, but these are not included in the FIS. I am trying to understand if putting costs on electric bills is more fair to NoVA. Otherwise NoVA has to pay for everything around here. Everyone should go out and convert their house to natural gas and install LED light bulbs to shelter themselves from the increases. Caution however, natural gas charges to residential consumers also highly inflated vs. the actual cost of natrual gas. Also the proposed fossil fuel ban indicates some feel all use of natural gas in Virginia must be banned. So I am wondering when I will be legally forced to convert back to electric heat pump. I am vulnerable to being supportive of the idea making Virginia ready for economic development re: power lines to business parks. Just freeze in the dark: it’s free. Re NoVa impact, why would a data center choose to locate in Loudoun and enhance the region’s tax base and tech reputation if it weren’t for the cheap(er) electricity here rather than further northeast? Well good question Acbar about why Loudon data is happening quite the way it is. Historically of course AOL was out there long before I was here. This should be a taxpayer burden. Dominion did what the regs required at the time with these storage ponds. We are retrofitting today’s hindsight on yesterday’s practices, and that is a governmental responsibility, not the responsibility of Dominion’s ratepayers. Perhaps the difference isn’t as stark where Dominion’s electric customer base overlaps so much of the State’s tax base, but the cumulative impact on electric rates someday will erode one of the biggest advantages Virginia offers to attract new businesses. Totally … and the ratepayers should either not bear the cost or only bear a small part of it. But what I tried to emphasize earlier was that other utilities were taking a different route even though no regulations were in place until 2015-6. They chose to line and cap when closed as a ‘best practice’. Why should it be OK to cheap it out disposing of toxic waste, knowing the waste is toxic, which the utilities did? Why shouldn’t the company be the primary financier of their decision, not the taxpayer? Maybe there wasn’t a rule … but the company was not being responsible with harmful substances .. the ultimate ‘kick it down the road’ action. Shareholders should pay, not the government. Agree. Ratepayers paid monthly bills that recovered the costs for whatever Dominion did with respect to coal ash. That is proper ratemaking. But if those actions are somehow found to be inadequate (perhaps, Dominion should have done more earlier, as you suggest) the costs of further remediation have nothing to do with the electricity consumed previously. The additional remediation is not a cost of generating today’s and tomorrow’s electricity. We need to pay for recovery of proper ash treatment costs incurred by Dominion on a going forward basis. That’s matching revenues and costs. It’s improper matching to reach back for costs that should have been identified and recovered earlier. Moreover, if current ratepayers are forced to pay the past remediation costs it would only encourage utilities to play games with their responsibilities. We don’t want excessive steps to be taken to address coal ash but we equally don’t want insufficient steps to be taken either. If there is evidence that Dominion knew it should have done more earlier, its shareowners should eat the costs. They can sue the directors and officers. Don’t want to get too far into the ratemaking weeds, here, but utility rates are fixed for the future, and past costs adjusted for known and certain changes are used as an indication of those future costs. Subtracting the cost of today’s ash pond remediation from the utility’s cost of service would not be proper; assigning the cost that way would cause it to fall on ratepayers. If you really want to assure that shareholders pay the cost of remediation today as a penalty for past malfeasance, then the Commission must impose the penalty on the parent company so that it does not appear in the utility subsidiary’s operating accounts at all. Trying to leave those costs on the utility’s ledger, if they remediate past practices that were lawful at the time and not disallowed by the Commission when reviewed in a timely manner, is simply unfair to today’s ratepayers. I agree with TMT, if the case can be made today that Virginia Power knew better at the time that its practice would harm the public, even if lawful, then that’s a liability for DE shareholders to bear — but not DE’s subsidiary VP’s current ratepayers. I can’t tell is these broadband investments approved for electric utilities is for expansion within their service territory or anywhere they choose. Might we find other ways to expedite business expansion in areas with need of economic expansion than to sink such huge amounts in infrastructure that might never be used? I have seen limited wins on localities having prepared industrial areas. It seems that businesses more often select an area to locate and specific packages are developed at that time. I share Steve’s concern about the growing number of additions to consumer bills – and especially residential customers since businesses are often excluded from responsibility given residential customers. I am disappointed that the grand solution assigned the coal ash costs to rate payers – especially since there is investment return also charged rate payers. Stock holders are getting far too good of a deal again. Years ago, in the ’80s, California utility bills became so loaded with subsidies like these that the typical retail electric bill became grossly larger than the actual utility-cost-based calculation. The PSC became powerless to stop the legislated subsidies and even added to them. There were some bright economists who thought up a clever way to defeat this trend using wholesale markets. The idea was, create a California electricity exchange into which anyone (including independent generators) could sell, and from which anyone (including resellers of bulk electricity) could buy, and let the retail customer have the right to buy from any of these resellers at a deregulated, competitive price, and consign the traditional utilities to a wires-only role, operating as common carriers, to deliver these competitive options to every customer that wanted them. There was a famous summary of this proposal, called the “Blue Book,” which won the support of all concerned. Even the utilities supported it, as they saw this as the only way out of the death spiral they were in due to all those subsidies. The economic forces of retail competition, or “retail access,” would do what legislators didn’t have the sense or political will to do: impose market discipline on retail rates. Well, it started a trend, that Blue Book, and the FERC decided in a series of late ’80s and early ’90s orders to impose wholesale markets on the entire nation, along with independent system operators to run them, and retail access became the rage in State after State, including in Virginia. Deregulation and market-based rates were adopted widely across the electric utility industry. We’ve still got those laws on the books in Virginia, but with severe restrictions these days on who can use them to actually gain retail access from the likes of Dominion. But it should surprise no-one that the bigger retail customers are getting restless, seeking to take full advantage of the vestige of retail access still available in Virginia and even looking to loosen those restrictions someday. And it should surprise no-one that Dominion and the other electric utilities will come to see using their rates for a subsidy machine to accomplish non-utility social goals as, ultimately, an existential threat. But in the short run, they’ll continue to trade a few popular subsidies tacked onto retail bills for the outrageously favorable rate treatment they are now receiving from the GA and the cowed SCC. That’s because the utility’s management, who know where this process will lead and dread the outcome, work for a holding company that has other, short-term financial imperatives and shareholders to please. And boy are they kept pleased. California, here we come. Or, deja vu all over again. What a beautiful comment, Acbar. And a potent history lesson indeed, given that California’s electricity cost soars ever higher above the national average and still its Pacific Gas and Electric seeks to go bankrupt. What a remarkable record for California, being 35% above the national average in 2011, then jumping to 60% above the average in the space of five years (from 2012 to 2017), during its big, irresponsible expansion into renewable power trying to reach 30% of market, a crazy gambit the state had to desperately curtail like China, to keep the resultant wild price swings and unstable power delivery, under any semblance of control. And likely too, we’ve seen nothing yet, as it’s only the start of California’s crazy ride away from reliable affordable electric power in the state, shoving the entire system over the cliff. One lesson learned here is that keeping Dominion in the center of Virginia’s electric power scheme is now more important than ever. So far it has proven itself a critical lynch-pin and anchor for economic development in the Commonwealth, an incredible asset to the economic health and future of Virginia. Electric power generation and transmission in Virginia should not now be turned into a wild west rodeo. This is where we’d otherwise be headed without the proven competence of a world class operator and stabilizing force like Dominion. It’s kinda hard to compare something that depends so much on location/weather as utility bills… So let’s make a little sense about this rate comparison … and CA and renewable energy bashing… . I threw Iowa into the mix as they have the highest portion of non-hydro renewables and they are in the wind corridor in the middle of the country. Yes, CA has higher rates … $15.34 per kw/hr vs. VA … $11.08 and IA… $10.52. AND when you compare average monthly bills and consumption the story is different. CA and IA are close … CA $88 and IA $94, while in VA the avg mthly bill is $124, @50% more than CA. Then let’s add average monthly consumption where Larry’s comment about high rates applies, and a state’s regs doesn’t punish demand reductions …. CA 583 avg kw hrs/mth … IA .. 843 and VA 1,117. CA uses less per month than 47 other states and in VA is the 10th highest state for monthly use. So, the changes to a clean energy economy means your utility bill is less regardless of what the rate is, and if you make the most of the renewable resources available, it doesn’t cost the customer more. I didn’t mention renewable energy, much less bash it. Renewable energy was not a significant consideration at the time of the Blue Book debates, other than the inflated payments for small power production from renewables mandated by the CA Commission under PURPA. I’m not advocating higher cost electricity but the plain truth is when electricity goes up in price – people us less. This is especially true in California, Alaska and the US Northeast – and Hawaii – which has very little native fossil fuels -like most islands – that generate electricity from diesel generators. Electricity on many of the worlds islands can be double what we pay in Virgina – and amount to several hundred dollars a month. That map correlates to the use of heat pumps and central ac in the south… Not prices. Those in the north could never rely on electricity for heat. They use oil, gas, or kerosene for heat. Correlation and causation are two different animals. Those in the north could never rely on electricity for heat. Tell me about it. In early 1980, I was transferred to Des Moines (a great place). But with all of Carter’s energy crap going on, no one was building houses with gas heat. So needing a place to live, I bought half of a new duplex with a heat pump. There were a couple winter months over five years when the electric bill was pushing $250. That’s in early 1980 dollars. The implication is although the RGGI states carbon footprint emissions look better than Virginia on electric use (as TomH keeps reminding me), the reason they look better than Va. is partially because we are not comparing the carbon footprint on a common basis (home heat + elec). For this reason, including Virgina in RGGI is questionable because Larry’s map is proof Va. is in a region with a different energy use strategy. TBill, I am not sure about the connection between RGGI and the mild climate in Virginia. I have said all along that the success of RGGI is due to the way the auction dollars are spent. The actual carbon emissions have always been below the annual targets, so the carbon limits themselves have not had a great influence on emissions. The RGGI states reduced carbon emissions and reduced energy costs by $2.3 billion because the auction dollars were spent on energy efficiency, and various programs to reduce the costs and make it easier to install customer-sited solar arrays. California also invested heavily in energy efficiency and renewables, which contributed to less electricity purchased from utilities resulting in lower bills. Both California and the RGGI states accomplished the energy savings in ways that did not harm the financial health of their utilities. Rates should be lower here for a variety of reasons, but a big one is that one power plant is used more here. Our summer and winter peaks are very similar, so we get more use out of a power plant than they do in the northeast where a somewhat higher investment is required to build a plant to meet a higher peak in a single season. The regulatory changes in other states that opened up customer choices resulted in lower utility bills. In Virginia we are handing the future of our economy over to a few energy companies and institutionalizing a long-term stream of higher energy costs. Our energy future should be based on sound planning, including consideration of a variety of new methods that will save us money and make our system more reliable. Currently, corporate profitability and the political levers that need pulling are the primary considerations in Virginia. Th GA has decided that the RGGI auction dollars will return to the utility’s coffers. No price signal will actually be sent to modify behavior. It is claimed that the money will eventually make its way back to the customers. But absent any objective rate review, I don’t see how that is possible. We continue to pass energy bills that are more accurately described as corporate welfare rather than well-considered energy policy. “No price signal will actually be sent to modify behavior.” Sadly, yes, exactly right. Not sure if we can properly call it welfare because they are already apparently well-off, with the stock market analysts saying what chumps we Va. residents are for allowing such a lucrative profit margin. Agree with you, ND. The usage map reflects the ready availability of cheaper alternatives to electricity — especially natural gas and oil — in the northern tier. Those distribution systems don’t exist in parts of the country where there is little need for them. About all you’ll find in the deep South is a few heating oil and propane distributors because the heating cost annually is too low to support the cost of, say, building out natural gas pipeline infrastructure. Heat pumps dominate where heating loads are not severe; in fact in a mild climate a heat pump can beat natural gas for cost efficiency in providing the same amount of heat input into the home. 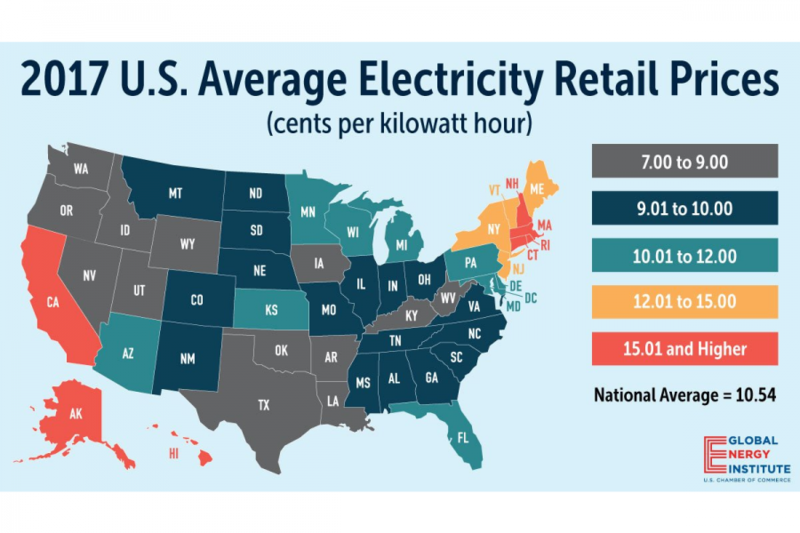 Plus, the border states (like KY and VA on that chart) where electricity usage is higher also reflect another phenomenon: the relatively low retail price of electricity in those States. that shows heat pump use and it would be on regional bases rather than state electric price rates. All those lower priced states that are adjacent to the higher priced states – they all heat about the same way between heat pumps and other heating – it doesn’t change by state line – the use of the electricity is tied to its price. Also look at California and Hawaii – where electric prices are the highest in the country and use lowest. It’s a simple supply/demand issue. In Europe where electricity is very high – use is correspondingly low. On most islands in the world that use diesel fuel to generate electricity – costs are high and use low. The primary point is that like a lot of things – when price goes up – use comes down. But a primary difference with electricity is that there are ways to reduce consumption – that are cost effective – from more insulation to technology-based more efficient heat pumps, LED lights, etc. Yes, having lived in the North, oil is the most prevalent residential heat source. But looking at the maps there is another reason that make average price and consumption issues an apples and oranges comparison. That is … monies and policy that support making not only efficiency efficiency retrofits but also roof-top solar. Larry’s excellent usage map shows New England, CA and HA as states with the lowest use. I don’t know about NM’s policies. Those are also the states with primary carbon reduction policies, moving toward generating more energy onsite and locally. When you put solar on the roof, CA has the most by a mile, you are reducing central generation just like the reduction comes from needing less because of efficiency. Virginia’s use says as much about Dominion’s control of the regulations of on-site and third party generation as much as anything else. No, not correct. Instead it is quite the reverse. Roof top solar is most expensive you can buy, and fails as a carbon reducing technology. It overloads the grid grid when sun shines, forcing negative pricing, then collapses supply altogether at night or on clouding days, forcing ever more fossil carbon up into the sky due to ramping up and down of coal, gas, and oil, not to mention great redundancy and piled on costs up and down the line combined with unstable grid. Hence, roof top solar is highly inefficient, it is very costly in a myriad of ways, and it infects the entire system with excess costs, inefficiencies and gross unreliability within grid that is highly dangerous. Thus solar breeds a series of problems that grow and spread exponentially like a virus as more and more solar comes on line. Residential solar is more expensive per kWh of output than commercial or utility-scale solar arrays for several reasons, but that is not the point. If a homeowner can install solar panels and pay a lower net cost for electricity – it saves them money. Output from the solar is essentially free after the first 25-30% of its useful life. Unlike with utility-owned generation in Virginia there is no economic burden on other customers for 35-40 years for customer-sited solar. Customer-sited solar reduces the peak and lowers the cost of wholesale electricity to the utility and saves other customers money. The surplus of renewable generation in the daytime and the drop-off at night is an issue in California. They have a percentage of renewable capacity that we might not reach for decades here in Virginia. But the problem isn’t the solar generation. They don’t have the widespread interconnections that exist within PJM. If California had greater interconnections with the hydro-rich states in the northwest, that problem would disappear. Studies have shown that customer-sited solar generation within the distribution system actually increases system reliability and resiliency and avoids costs that would normally have been incurred. Some additional cost is often needed to accommodate two-way flow in the distribution system, but this is more than offset by the other benefits. Greater contributions from customer-sited solar would lower costs in Virginia. It would avoid the higher costs associated with utility-owned solar and avoid the need for more conventional generation. Dominion now has surplus generation and so does PJM. More solar here would not reduce reliability or increase costs. In fact, it would improve reliability and reduce costs. Even though they have obstructed it for years, Dominion now realizes that solar is the lowest cost source of new generation in Virginia. They just want to own and control it all so they can make more profit. Under the current rules, customer-sited generation is a threat to their bottom line. That’s why we need to give them a different way of making money. BUT… there are ways to accommodate these issues and the result is cheaper and more efficient too. From the same report from RMI … Insight Brief – Demand Flexibility. •	Utilities across the U.S. are now considering demand flexibility as an important component of “non-wires alternatives” that can defer large infrastructure investments. •	In Washington, Bonneville Power Authority recently gave up a long-term effort to build over $1 billion worth of new transmission and will be addressing this need with procurement of non-wires alternatives instead. •	demand flexibility flattens the net load curve and reduces peak load, significantly mitigating the “duck curve” and thus the necessary ramping in the afternoon hours. “Traditional cost-of service regulation rewards utilities for investments in capital they can include in their rate base. However, new regulatory tools, such as performance-based ratemaking, can allow utilities to still earn returns when using lower-cost and/or third party-owned demand flexibility as a grid resource.” And this is where Dominion has blocked any significant changes for years. When we lived in NJ back in the 1970’s, electric was very expensive, I believe highest in the nation, due to a rapid build out of nukes. So that encouraged anything other than elec for heat, hot water, and eventually industry built their own smaller nat gas gen capablity. The latter made the utilities PO’ed and NJ adopted policy for 100% coal power going forward in the 1990’s. NJ did not get too far along on that path, thankfully, I think because PJM grid imports reduced need for states to build their own plants. It looks like NJ is no longer the most expensive. But each region will have its own trajectory due to state policy over the years. Here are state-by-state carbon footprint estimates. Virginia is low carbon as 39th lowest, about same as MD and lower than NJ. I need to study further, but I am pretty sure this is state-boundary-line emissions. So if your state imports a lot of elec, you get credit for being lower carbon state. A “true” carbon footprint would need to adjust for imported electricity, somehow. Still we have the bias that states which import energy and have less manufacturing get credit for being lower carbon. Somehow we still need a way to normalize to a hypothetical self-sufficient state basis. As I recall, the RGGI states count all of the carbon sources that are under that state’s regulatory authority as being under that state’s carbon output. That means the big coal plant (Mt. Storm) owned by Dominion in West Virginia counts towards Virginia’s carbon output. The generation Dominion owns to serve its North Carolina service territory, does not count towards Virginia’s carbon emissions. PJM aggregates generation and demand over a larger region. This provides economies and smooths out the ability to match supply with demand at the lowest cost. Each Load Serving Entity is responsible for owning or having under contract enough capacity to meet its peak load plus required reserves. This prevents a utility from getting a free ride by always depending on someone else to provides its energy supply. State boundaries only have importance in today’s energy system because each state has its own utility regulator and legislative authority. So Virginia is much more energy efficient. You are saying Virginia is worse on RGGI elec carbon CO2, but that’s in large part because NJ and MA are using nat gas/oil heat (CO2) directly to heat their homes, which RGGI is not counting, whereas Va. is mostly using electricity for home heat. I am not including New York right now because New York is overwhelmed by New York City (low energy region) impact. I presume New York state excluding New York City might look more typical. Sorry, but the numbers you provided do not apply to my response. 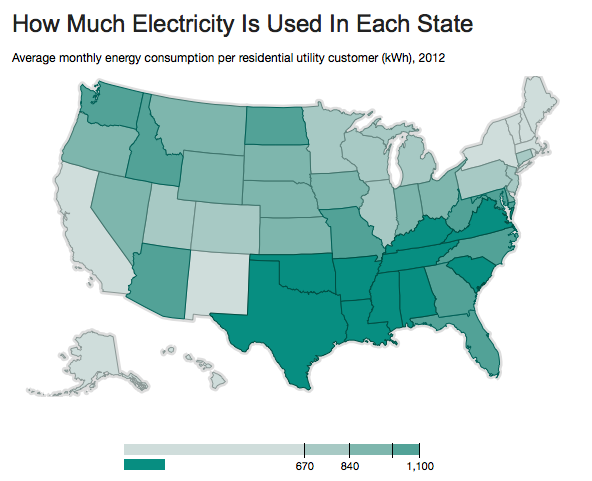 You have cited the total household energy use in states north of Virginia. The numbers have only a little to do with the efficiency of energy use (which is higher in MA than NJ). Household energy use is higher in those states because it is colder north of Virginia. RGGI has only to do with electric generation not CO2 output from all sources of carbon emissions. My point was not about whether or not we should be members of RGGI. I am saying that it makes a great deal of difference on how the auction money is spent. In the RGGI states the auction money is paid by the utilities (and ultimately their ratepayers). By spending the auction dollars to reduce energy use and increase non-carbon generation, customers in RGGI states have saved $2.3 billion in energy costs while reducing carbon emissions. In one scenario here, the utilities will get the carbon credits for free and can resell them to other RGGI participants. The GA seems to be willing to give those proceeds to the utilities. The utilities claim the extra profits will make their way back to the ratepayers, but without a rate review, I don’t see how that is possible. So one of Virginia’s ways to deal with RGGI would be to fail to have a market signal that would discourage higher carbon emissions and it would be a profit center for the utility and a higher cost for customers. Does this really make sense?